sorry Mikey and Kirby. We got to get faster. 51.502! Faster than Hall and 2 to go! Perfectly capable of making the Final 4 but can he make the podium? 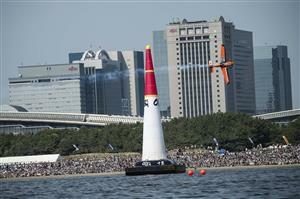 JUST IVANOFF NOW TO FLY AND WE'LL HAVE OUR RESULT FROM THE FIRST EVER RACE HERE IN JAPAN! It's a DNF! NO... that's an over G for Ivanoff and no podium... right down to the wire! Bonhomme: "A really good start and hard, hard work. The new format is busy for us, we knuckled down and got on with it. TO come up against Yoshi with a 50s that's hard work. Fantastic team, tactics working out well and plane running beautifully." 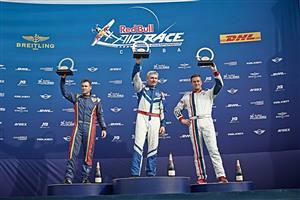 Congratulations for Paul Bonhomme, Matt Hall and Matias Dolderer! Hall: "I made a mistake but got championship points, and it's about the end of the year result. 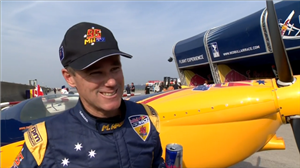 The plane is a lot differerent to last year and i haven't had as much time in it as I'd hoped." Dolderer: "At least I made it on to the podium and it's working out. 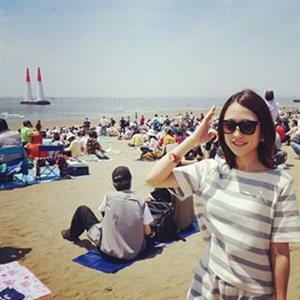 I can do it and I'll do it again." Round of 4 starts when? Let me see a race! Yoshi is such a gentleman. He did quite well. Hope he will be on the podium sometime soon. 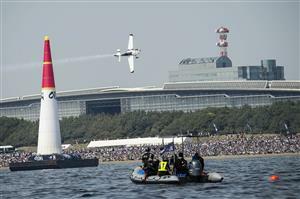 #RedbullAirRace please come back to Japan next year! !